Western blot analysis of extracts from HeLa cells, transfected with 100 nM SignalSilence® Control siRNA (Unconjugated) #6568 (-), SignalSilence® CDK5 siRNA I #6216 (+) or SignalSilence® CDK5 siRNA II (+), using CDK5 Antibody #2506 (upper) or α-Tubulin (11H10) Rabbit mAb #2125 (lower). 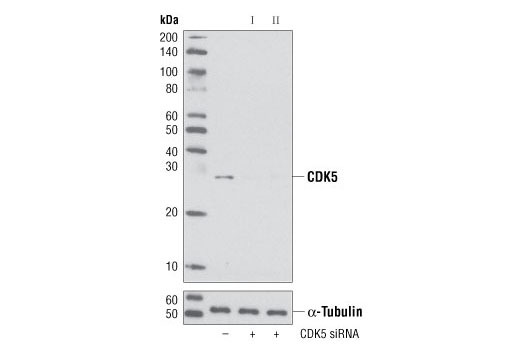 The CDK5 Antibody confirms silencing of CDK5 expression, while the α-Tubulin (11H10) Rabbit mAb is used to control for loading and specificity of CDK5 siRNA. CST recommends transfection with 100 nM CDK5 siRNA II 48 to 72 hours prior to cell lysis. For transfection procedure, follow protocol provided by the transfection reagent manufacturer. Please feel free to contact CST with any questions on use. SignalSilence® CDK5 siRNA II from Cell Signaling Technology (CST) allows the researcher to specifically inhibit CDK5 expression using RNA interference, a method whereby gene expression can be selectively silenced through the delivery of double stranded RNA molecules into the cell. All SignalSilence® siRNA products from CST are rigorously tested in-house and have been shown to reduce target protein expression by western analysis. Cyclin-dependent kinases (CDKs) are serine/threonine kinases that are activated by cyclins and govern eukaryotic cell cycle progression. While CDK5 shares high sequence homology with its family members, it is thought mainly to function in postmitotic neurons to regulate the cytoarchitecture of these cells. Analogous to cyclins, the regulatory subunits p35 and p39 associate with and activate CDK5 despite the lack of sequence homology. CDK5 is ubiquitously expressed, with high levels of kinase activity detected primarily in the nervous system due to the narrow expression pattern of p35 and p39 in post-mitotic neurons. A large number of CDK5 substrates have been identified although no substrates have been specifically attributed to p35 or p39. Substrates of CDK5 include p35, PAK1, Src, β-catenin, tau, neurofilament-H, neurofilament-M, synapsin-1, APP, DARPP32, PP1-inhibitor, and Rb. p35 is rapidly degraded (T1/2 <20 min) by the ubiquitin-proteasome pathway (1). However, p35 stability increases as CDK5 kinase activity decreases, likely as a result of decreased phosphorylation of p35 at Thr138 by CDK5 (2). Proteolytic cleavage of p35 by calpain produces p25 upon neurotoxic insult, resulting in prolonged activation of CDK5 by p25. Research studies have shown accumulation of p25 in neurodegenerative diseases, such as Alzheimer's disease and amyotrophic lateral sclerosis (ALS) (3,4). Dhavan, R. and Tsai, L.H. (2001) Nat Rev Mol Cell Biol 2, 749-59. Patrick, G.N. et al. (1998) J Biol Chem 273, 24057-64. Lee, M.S. et al. (2000) Nature 405, 360-4. Kusakawa, G. et al. (2000) J Biol Chem 275, 17166-72.